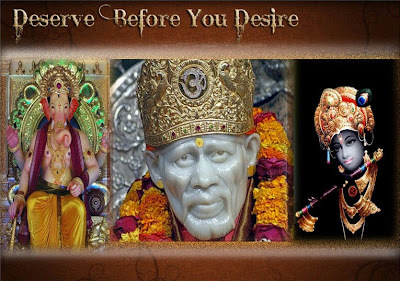 Shirdi Sai Baba, love embodiment, who always use to speak in soft loving voice, sometimes talking with sense of humor, was also known for occasional outburst of anger, using of foul language and even physically beating the people, to the length throwing stones at them. For those unknown with His spiritual hierarchy would think of Him as mad Fakir. Those who had some idea of the greatness of Shri Sai Baba, actually looked forward for getting some abuse from Him or get some beating from Him. An example could be given of Sai Baba's anger from Shri Sai SatCharitra in chapter 23 of Shama's getting stung by a poisonous snake. Struck with fear, he ran towards Masjid (Dwarkamai) to his Deva (Saibaba) for help. As he approached the Masjid, he saw Sai Baba in rage. He got enraged and said - "Oh vile Bhaturdya (Priest) do not climb up. Beware if you do so" and then roared - "Go, Get away, Come down." Seeing Sai Baba thus red with wrath, Shama was greatly puzzled and disappointed. But later it was found out that it was not Shama on whom Sai Baba was angry with, the order was given to the poison in Shama's body. At another time a trader had decided to gift a baby horse (foal) to Saibaba if his wish was fulfilled. On the fulfillment of the wish he sent the foal (Shyamsunder, who was much adored by Sai Baba and the grown up horse loved Baba equally, one of the most lucky animals), through a servant who had to work just for survival. On seeing him approaching Sai Baba suddenly got in rage and threw stone at him injuring him physically. The dazed and angry victim wanted to file a complaint with police against Sai Baba for the same, but was stopped by prominent devotees. They tried to explain him how lucky he was and that they themselves wait and long for such a beating. He was presented with some money by the same devotees and with it he himself became trader and owner of land and animals. The everyday work for survival ended for him. On some instance Sai Baba would just get in rage without any apparent reason for the onlooker. He would be looked upon as getting angry at some imaginary object in air. Later it would be found out that exactly at that time a close devotee of His was in great trouble and survived or was saved miraculously. For those having affinity with spirituality knows that Saints and perfect Masters getting angry at them have a great beneficial meaning for them. Was reading A saint should not do this. There are few lines on the same subject. "When the Master physically hits a person, they are free and this actually kills all their sanskaras. And that means, of course, liberation." These Masters — Upasni Maharaj, Meher Baba — have no greed. They don't have lust. They don't have anger. Nothing. So why should they beat a person? If it seems like anger, then it is sham anger. When they thrash you, it means no more births and deaths for you." Saibaba Himself used to say that he longed for his devotees love and that he would always be by their side looking for their welfare. He would always respond their call and be by their side protecting them and looking for their spiritual and worldly welfare. Anantkoti Bhrahmand Nayak Raja Dhiraja Yogiraj ParaBhrahma Sri Sat Chit Anand Sadguru Sainath Maharaj Ki Jai! Can we understand Sai Baba's activities?